During our time in Ponce, we examined a cheap way to visit more islands of the magnificent Caribbean. After we informed ourselves about flights, connections by sea and hotels, we simply booked a cruise as the cheapest and easiest solution. This way, we could visit five different islands within one week, had all meals included and a small, air-conditioned room every night. In general, the whole thing was extremely classy compared to the months in Ecuador and Puerto Rico. So to speak: I initially had to get used to the warm shower. 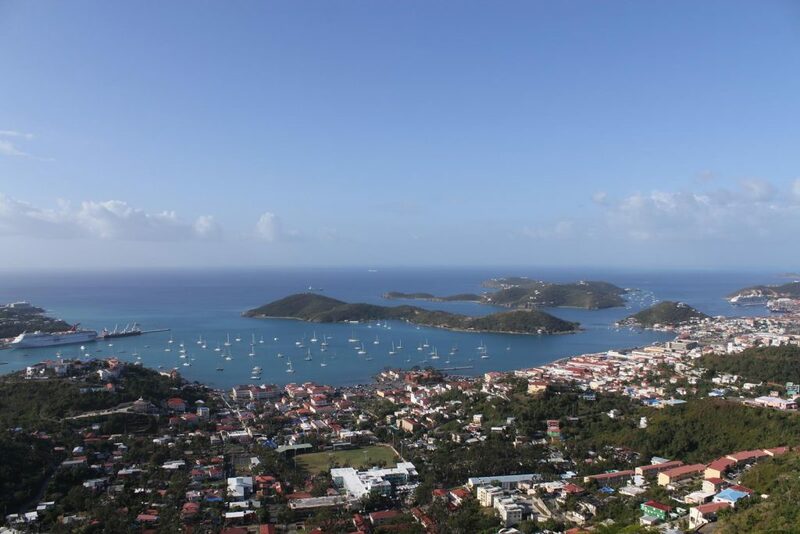 Our first port was on Saint Thomas, part of the US Virgin Islands. Saint Thomas has an area of 80 km² (31 mi²) and is home to about 51,000 people. The main source of income is tourism, which is strongly influenced by the almost daily arriving cruise ships. Otherwise, the island, that belongs to the national American air network, can be reached by air easily. In 1925, the island (including St. Croix and St. John) was bought by the United States for 25 million US-Dollar. Since then, it is the only area of the USA with left-hand traffic. Nevertheless, the cars are without exception American / European models and are left-steered. The driver sits, so to speak, next to the shoulder. This is weird and really takes some time to get used to! Although the island is not particularly large, it offers recreational activities for everybody. From all sorts of water sports to hikes through incredible landscapes to tax-free shopping (diamonds are very popular) or world-class golf courses, everything is available and nothing is far away. We took a two-hour tour of the island and spent the rest of the day on one of the beautiful beaches. But pictures are better than a thousand words. By the way, the water is pleasantly warm and radiates in typical Caribbean blue tones. I usually tan very fast, tolerate a lot of sun and could have ancestors from the desert; in the Caribbean, I got sunburned. Otherwise, during a walk or a drive, you will find many motives for photography. In addition to countless fountains and statues, you get a wonderful view over bays and beaches and memorabilia of bygone times everywhere. Among them are historic buildings as well as by natural disaster destroyed places and buildings. The older houses testify to the Danish colonization in the 17th century and their partly dark history: For some time, the largest slave auctions in the world were held here. The whole thing seems downright absurd when you see the island today. A taxi driver told me, that locals know their origins and do not take liberty for granted – admirable attitude. Next, we spent a few hours in Barbados, my favorite place of the cruise. You can check out some pictures, a few written lines and a video in the next post.